This complex was fantastic from the day we arrived. The reception staff could not do enough to make us feel welcome. We were booked into the Villas Paradise, but we were placed in Apartments Dunas. It was a two bedroom apartment which was clean and spacious. The food catered for everyone, breakfast had eggs, bacon ect.. As well as the usual continental selection. Lunch and dinner always had a chef cooking steak, fish pork chops, and lamb chops on a griddle as well as all the other hot food selection. The salad bar also has a wide selection of fish, pasta, cheese salads and the deserts must have been nice as both my daughters had 2/3 servings every day! There are 7 pools to choose from, 4 of which have a pool bar that open at 11am with free flowing beverages and unlimited ice cream. We preferred the pool near the reception as the view to the sea was lovely and there was always a cool breeze and there were always free sun beds no matter what time of day. Outside the Apartment was a nice quiet pool which was never very full but this pool does not have a bar. There is a gate at the bottom of the complex that takes you onto the beach and the resort of Jandia, but you need to take your card key to activate it. The beach is beautiful but you must have an open mind as you will see the odd nudist on the beach, although I must admit I was shocked to see a nudist jogging down the beach, which made me laugh! The animation team were fantastic, very talented and all have a great sense of humour. This complex does seem to go to bed once 11pm arrives all our European friends seem very eager to get tucked up! But if anyone wanted to carry on partying there are a wide variety of bars in the resort one of which is an English bar. On our last day we booked a shower room with the reception, which ended up been one of the hotel rooms these are also very clean and extra large for a hotel room. I would 100% go back to this complex and recommend it to my friends and family. Jandia Dunas Paradise resort is fantastic. Take no notice of the bad reviews on some sites. We stayed for 3 weeks in Jan 2010 and there is nothing to complain about at all. We stayed in the villas that people complain about. Brilliant. They were spacious and very clean. The bed was extremely comfortable and huge. The villa had a pleasant living area and the courtyards and fountains in the villa areas were picturesque. The staff were all very friendly and polite, in all areas, including gardeners and maintenance. The shows each night were very good, the animation team worked hard and the shows were really varied. The gardens are very well looked after and everything is extremely clean and well maintained, from the hotels to the pools and pathways. The train was working every day during our 3 weeks. We did not use it as it is not far to walk from the hotel area to the main road, It is a pleasant walk as the gardens are so pretty with well looked after trees, shrubs and flowers. I expected a really steep hill it is just a gentle slope!! There were plenty of British people staying at the complex, so do not imagine that it is all German. We were certainly treated with respect and friendliness by all the staff, including reception staff who DID speak English and sorted out a problem for us quickly, pleasantly and efficiently. I would like to compliment all of the staff for their hard work. You were all brilliant. Hopefully people will ignore the ridiculous reviews that some people write.. I must admit to being apprehensive myself after seeing what some people had written. However, we discovered it was a wonderful place to stay. Some people must just be professional complainers. After reading some reviews on this hotel, we really didn't know what to expect. Firstly all staff including reception/waiters/cleaners were all polite & friendly. The english in the hotel were a minority but this wasn't a bad thing as we never saw anybody drunk and it got you talking to other people. We never had any trouble in getting a sunbed even in late morning or in the afternoon which was fantastic as we didn't have to get up at the crack of dawn to put towels on the sunbeds. (this really did make a difference, it made the holiday really relaxing. The hotel itself was very clean, there was always somebody cleaning/gardening etc. The food was Ok, it wasn't as good as other 4* hotels we have stayed in but it certainly wasn't any worse. Some days the choice was limited but you could always find something to eat. The entertainment was really good, the animation team worked really hard & some of the shows they produced were really professional, others weren't! When walking down to where the entertaiment was held the bungalows looked very old & tired, some were boarded up so not sure if these are going to be renovated. The location of the hotel was good as there were shops/restaurants within a short walking distance which you do not normally get with all inclusive holidays, the hotels are normally in the middle of no where. The not so good points were the wild cats, the hotel requested for you not to feed them but you couldn't believe how many people did,they didn't bother you but it wasn't very nice to see them hanging around the restaurant. The other thing were the flies, I have never seen so many, we couldn't believe there wasn't a devise in the restaurant to catch them. Apart from those 2 little points we had a fab holiday & would recommend this hotel to anybody. on our late arrival, we checked in at reception, no one could speak any english and the staff were abrupt and quite rude. we went to our 4 star room and it was a chalet, although it was ok it was only 3 star in our opinion, and we went to reception and asked to be moved into the hotel, on being shown their booking form, it didnt state that we wanted the hotel and not the chalets, so this may have not been their fault. we were told to come to reception in the morning to see what they could do, as we were very tired by then ,we agreed. when we did so they said we couldnt be moved until the following morning. so we couldnt really unpack and settle in. the hotel itself was lovely, the cleaning staff and buffet staff were always cheerful. the entertainment was really good . the animation team worked very hard and although there were hardly any british people ther for the first week it wasn't a problem as most of the other guests were sociable. we took part in a show one evening to represent the minority of brits there and after that , the other guests made a point of congratulating us on our participation!! laughter is the same in any language!!! there was never a wait for sunbeds,which were of very good quality and parasols were ample. the poll areas were spotless and even at the end of the day there was no rubbish to be found anywhere, toilets were cleaned throughout the day and bins emptied too. Stayed at the Stella Dunas Appartments as a couple in February for one week and was very impressed. Ideal for a nice relaxing holiday. Returned in July this time staying at the Dunas Paradise Hotel for a family holiday. We were slightly apprehensive that it might be too quiet for our 14 year old but she had a great time. She loved the pool games and the evening shows. The food is typical buffet style, with a good variety and always plenty of it, no matter how late in the session that you sat down to eat. Staff were were always polite, friendly and helful. This was the first family holiday abroad we had been on and my husband and myself did feel quite nervous. When we pulled up at the hotel we were amazed on how beautiful the hotel was. It looked lovely. On checking in we did feel the reception staff a bit abrupt and miserable but the service was fine. On getting to our room we were very happy. The storage space was more than enough and the room was spotless. It was cleaned every day and sometimes we left i pods and money out and this was never touched. There was a good range of food. My son and husband are faddy so this was a worry. They never went hungrey. With the choice for lunch of pool bar or buffet and the varitey on an evening we could not complain at all. There was a good choice of meat or fish. With chips, pasta and salad. The deserts were lovely. A couple of days a week there was themed days with one day a big BBQ at one of the pools. There was no limit as to how many drinks could be taken in one go and ice cream was constantly available. With exception of the reception staff the rest of the staff was very friendly. All could speak many languages. As we were leaving I would like to point out that the receptionist was very friendly but we hadn't seen her before. The entertainment was excellent. There is a two week rota of shows. The shows alternated at which bar they were at. The children loved them also and thought they were very funny. During the day a time table was set and staff were constantly coming round the pool asking if anyone wanted to do different sports, Rifle shooting, Tennis, volley ball, water volley ball, water polo, football and darts. We are already looking into going back next year. The all inclusive food was fantastic, a massive selection each day so plenty of choice. 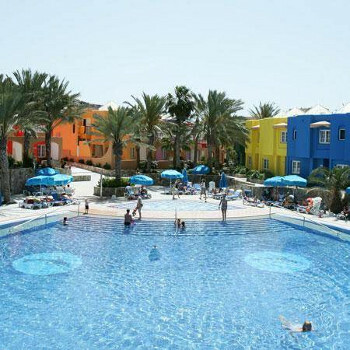 The staff were great with our daughter, and pool aeras and hotel in general was clean and in very good condition. Not a place for elderley or infirm with walking issues as everything is up/down hill or steps. Great location for the beach, and the quiter end of town. Ideal for a holiday with the kids, or a quite break. Largely German or Dutch guests, with no Brits drinking to excess and being annoying! (I am a Brit). We would consider this hotel again in future. didnt get off to a good start were told when we arrived that the 2 senior suites we had booked werent available by a rude woman on reception which is all you need to hear after all that travelling..after a bit of an argument we asked when could we have our suites and were told not at all and asked do we want to stay there or not?? instead we were told to come and see mamager in morning and were given 4 standard rooms which she expected my 13 and 14 year old boys to stay in a room on their own (i dont think so )so deflated we went upstairs and unpacked.. missed the welcome meeting in morning because we had to see the manager who then told us we couyld have 1 suite that day and the second suite 4 days later!! so that day was wasted having to re pack for myself ,partner and 3 children ,move to proper room and unpack all over again ,nightmare,by then i was in tears and wanted to come home..the rep was 19yrs old though looked about 14 and had been in the job only 2 weeks though he did try his best bless him.. mum and dad were finally given there suite on the saturday afternoon which was right at the other end of hotel and after waiting outside room for an hour and a half for luggage to be moved we ended up moving it ourselves.. suites are lovely with a beautiful sea view supposed to have a jacuzzi but ours didnt.. very spacious even for the 5 of us.. nice and clean all in all .. the food was a bit monotonous but all inclusive usually is but there was something for everyone,and desserts were good .. the location was,nt too bad compared to som others we saw on the way to and from airport.. most of the staff were friendly especially the dining room staff who always made a fuss of our 1yr old .. entertainment was ok ..nice hotel overall nice food nice staff only reason why i wouldnt go back is the location nothing going in in town in the evenings...if you like an all inclusive hotel and you tend to stay in and around the complex then i would recommend it .. The food is ok if you are staying of just one week.